(CNS): The trial of Brian Emmanuel Borden (29) and David Joseph Tamasa, who have both pleaded not guilty to the murder of Robert Macford Bush in West Bay on Tuesday 13 September 2011, began Thursday in a judge-alone trial before Justice Alex Henderson. The crown contends that one of the two shooters was Borden and the men were firing ammunition supplied by Tamasa. The prosecution says that both the defendants later boasted of their part in the killing of Bush to a friend, who will be a key witness in the trial. On the night of his death, 28-year-old Robert Macford Bush was picking up his girlfriend, Mayra Ebanks, at the junction of Capts Joe and Osbert Rd and Birch Tree Hill Rd in West Bay, as he was in the habit of doing, when two gunmen approached the car from behind and began shooting. 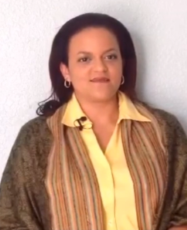 Bush started to drive away but lost control of the car, which crashed into a wall, trapping him inside as the gunmen, one armed with a shotgun and the other a 9mm handgun, approached the driver’s side of the car and shot him twice in the head at close range, injuring Mayra Ebanks with shotgun spray as she sat in the passenger seat. The pathologist concluded that both shots would have been fatal. In his opening statement, Andrew Radcliffe, QC, the lead prosecutor, said that Borden was one of the shooters and the other was Keith Montaque and they had been given a heads-up that Bush was on his way. A series of messages between Mayra and a phone belonging to David Ebanks, which the crown believes was being used by Jordan Manderson and was telling him that Bush was coming, ended at 11:08pm that night. At 11:14pm the David Ebanks phone sent a Blackberry messages to Brian Borden, who was in the vicinity of the murder according to cell site evidence, and not, as he had claimed to police in a statement before he was a murder suspect, at home at the time. The 911 call after the shooting made on Mayra’s phone by Tishara Webster, who had arrived on the scene and taken the phone from Myra, who was screaming and hysterical, was made at 11:20pm. Radcliffe explained to the court that the content of Blackberry messages is stored on the devise itself and nowhere else. He said that at 11:25pm, just a few minutes after the killing of Bush, the David Ebanks phone removed Borden as a contact, thus deleting forever the content of all messages between those phones – though not the fact that they were made. However, while the Ebanks phone initiated the removal of the contact between them, it took until 11:52pm (27 minutes) to achieve this. The prosecutor said the only possible explanation for this was that Borden’s phone was switched off between those times and suggested that Borden knew enough to understand that this action would delete all the messages – perhaps by watching television – but did not understand that both phones had to be turned on to complete this action. Radcliffe invited the conclusion that the timing of this indicates that it was done in order to hide their criminal involvement. The prosecutor said that an off duty police officer who was on the scene very quickly recognised Bush and saw that at that time he was still alive. USG officers arrived within five minutes of the 911 call and cordoned off the scene. When the paramedics arrived within 15 minutes of the 911 call, they tried to save Bush but could not find a pulse. Radcliffe said that later, in mid-2012, while Borden and Tamasa were being given a ride by their friend, Marlon Dillon, Borden bragged about killing Bush as they passed the murder spot. After they dropped Borden off, the conversation continued and Tamasa boasted to Dillon about his role, which was supplying the ammunition. The prosecutor said that when Dillon told police about this he could not possibly have known that the cell site evidence would support it. Tomasa has denied to police that he was friends with Dillon and claimed he only knew Borden slightly. Both the defendants, Radcliffe said, have also denied that this car trip ever took place. Bush had been warned by Tracy Watler that Borden wanted to kill him, Radcliffe told the court. After he was released from Northward prison in October 2010 and repeatedly up to August 2011, he had asked Watler to set up circumstances so that he could do this but she had refused. Radcliffe suggested that this hatred stemmed from the fact that they were from rival gangs but jealousy may also have been a motive, since Borden had previously had a sexual relationship with Mayra Ebanks, something he had denied in a police statement in September 2011. The crown believes that Jordan Manderson not only tipped off the shooters, Borden and Montaque, but may have also supplied the weapons. Manderson, the crown said, had previously told Mayra Ebanks that anyone wanting to kill Bush would have to contact him to “get the things”, which she took to mean guns. On the day Bush died, the crown said, Manderson had been at her home and had received a cell phone call and she was close enough to him to recognise the voice as being Borden’s. She could hear that he was telling Manderson that he was coming “for the things”, Radcliffe said. The trial continues in Grand Court this morning. (CNS): A former Cayman Net News journalist who became embroiled in the saga of Operation Tempura, the probe into possible corruption in the RCIPS, has taken the new governor to task for her comments about the local media in a letter to his local MP Liz Truss, who became a member of Cabinet this week. John Evans called Helen Kilpatrick’s criticisms of the press here “an almost unprecedented attack on the media in the Cayman Islands” and said that in his experience the problems lie not with local journalists but with “excessive secrecy in the public sector and the almost childish attitude of some civil servants and politicians to media interest”. He said, “Having myself worked out there as a journalist I know that there are issues with media coverage but in the vast majority of cases they stem from excessive secrecy in the public sector and the almost childish attitude of some civil servants and politicians to media interest. Evans continued, “My concern here is that this ill-considered and ill-informed attack on the media sends out a very negative message about the role of the UK in governance of the Islands. It suggests that the Governor’s Office and the FCO not only fail to respect the role of a free press in an Overseas Territory but also that they do not recognise the rights given to journalists under the terms of the constitution. Bluntly, we are talking about what could be construedas old-fashioned colonialist attitudes that are completely incompatible with the 21st century. According to the DoE, the Cayman Islands are home to various species of land crabs which, although they have successfully invaded the land, are all still seasonally dependent on the sea. 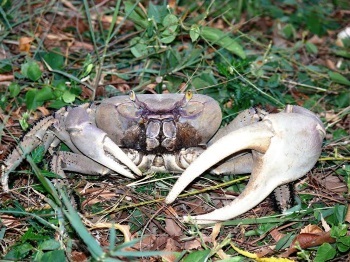 Most residents are familiar with “crab season” throughout July and August and this phenomenon is due to the fact that all land crab species cross the roads to get to the sea during the breeding season. 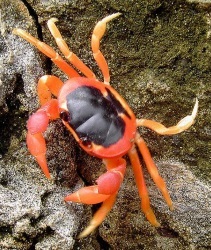 The reproductive cycles of, for example, the White Land Crab (Cardisoma guanhumi) (right: male with an obviously enlarged claw) and the Black Land Crab (Geocarcinus ruricola) (below) — both traditionally harvested for food and the later of whose colour can vary from yellow to dark purple — are closely linked to seasonal weather patterns and lunar phases and migrations are often initiated by heavy rains. For the first few weeks of the migratory period the crabs increase their foraging and gain weight rapidly. Males actively court females which then carry external egg masses on the underside of their bodies after mating. The eggs are carried for approximately two weeks prior to hatching and will eventually be released into the sea to ensure survival and larval development. The spawning migrations are typically completed within 1-2 days and the spawning takes place within 1-2 days of a full moon. 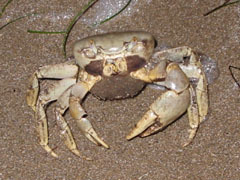 The White Land Crab is slow-growing compared to most other crabs, reaching sexual maturity only after approximately 4 years and large individuals may grow to over four inches across and over 1 pound in weight. This highlights the importance of letting the crabs reproduce when they embark on their spawning migrations. It is highly recommended that females are left alone if eggs are seen on the underside of their bodies (see picture right) so they can spawn and secure the return of many more juvenile land crabs. Females and males are generally easy to tell apart as males are larger and have a noticeably enlarged claw (cheliped). For more information on the land crabs please visit the DoE website and the Land Crab Species Action Plan. (CNS): the Health Services Authority has said that a team of local doctors, healthcare workers and policy makers is presently in the process of verifying and documenting the elimination of mother to child transmission (MTCT) of HIV and congenital syphilis in the Cayman Islands. The group is working to prepare a report that will be submitted to the Pan American Health Organisation/World Health Organisation (PAHO/WHO) for certification. Medical Officer of Health Dr. Kiran Kumar explained that countries need to document the process by which elimination is verified according to WHO guidelines. “We have achieved this goal due to the quality of our antiretroviral programme over the years. In order to receive certification, we need to document the verification process that we have undertaken, to ensure that there has been no MTCT for the past three years,’’ he added. Minister of Health Osbourne Bodden praised the Cayman Islands healthcare community, especially gynaecologists, paediatricians and midwives for maintaining zero levels of MTCT of HIV and congenital syphilis since 2004.